There is no denying that the burger is a staple of American cuisine. The art of crafting the most mouthwatering gourmet burger around is a trend on the rise, and in South Carolina, we’ve perfected that craft. Some burgers simply stand out among the rest. Here’s where to find the best in the state! Voted “Best Burger in the Upstate,” it’s easy to see why: You can expect fresh, hand-pressed burgers and fresh toppings that create nothing less than heaven on a bun. Fan favorites include the mushroom Swiss burger, their signature Spot burger, and their spicy habanera burger. If you think there’s nothing new and innovative in the burger world, you haven’t been to Bad Daddy’s Burger Bar. There’s nothing ordinary about their burgers: They pride themselves on using the best of the best ingredients and experimenting with unique combinations that makes your experience unforgettable, to say the least. If a burger could be the least bit healthy, you’ll find it here. Sesame Burgers & Beer source high quality ingredients, like hormone-free, pasture-raised beef, antibiotic-free and South Carolina-raised turkey and chicken, and local produce, pasta, nuts, and other edibles. You’ll appreciate the difference. A Greenwood tradition for decades, no trip to the Emerald City is complete without sinking your teeth into a Dixie With Cheese. You get the classic hometown diner experience, complete with booths and a U-shaped lunch counter, along with savory classic American favorites, made your way. The name promises it all: A fat, juicy beef patty burger with all the fixings, and plenty of sides to complement. You can get any of their burger combinations in your choice of grass-fed beef, chicken, beef and bacon, turkey, wild American shrimp, or black bean. And if you didn’t know a shrimp burger even existed, you do now. The only Grand Strand burger joint that even comes close to the deliciousness of Hamburger Joe’s in North Myrtle Beach is their second location in Surfside Beach. They keep their menu offerings simple and straight to the point, which helps them maintain high quality in every burger they make. This quaint, cozy burger hut is one of the Lowcountry’s hidden gems. Folks who come here swear by the sausage burger. You can also find all the traditional burger treats, along with some out-of-this-world Spanish fries. This Grand Strand burger chain knows their way around a burger. With original, off-the-wall creations like the California pizza burger, the Cheetos burger, the palmetto cheeseburger, and the peanut butter burger, alongside more traditional tastes, you’ll never fully realize the possibilities of a burger until you go here. 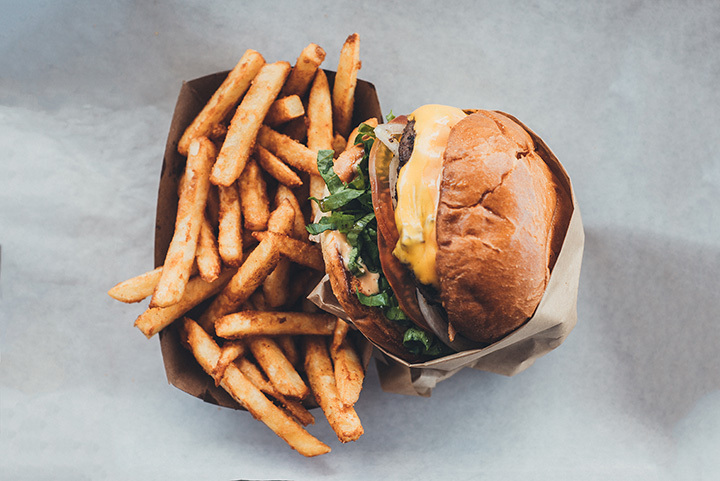 Paying homage to the coastal town of Pawleys Island, it’s easy to see why this burger joint earned the state’s top spot for “Best Burger.” Here you’ve got pick of several bread choices, cheeses, and other southern style add-ons to complete your burger experience. This small family-owned eatery knows how to make a satisfying burger. You can expect all the classic variations, along with all your favorite “extras” like mushrooms, grilled onions, fried eggs, ham, banana peppers, and seasonings. They also feature a whopping one-pound burger for extra hefty appetites.